This clean white NA2 Acura NSX sits on a set of Gold BBS LM wheels. 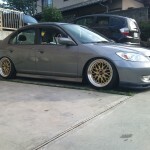 The BBS LM wheels look to be staggered and have Red Logo Caps. 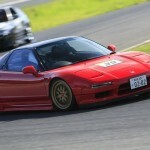 This entry was posted in Acura and tagged 18" BBS LM, Acura NSX, BBS LM, Gold BBS LM, NA2 NSX by admin. Bookmark the permalink.